In 2013, Cal Poly President Jeffrey Armstrong got an invitation to attend an overnight excursion at a working ranch courtesy of the CEO of RFD TV, a cable channel that features agriculture stories, old TV shows and infomercials. 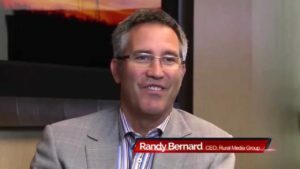 Then-CEO Randy Bernard is a close friend, Armstrong said. After that get together, Armstrong entered into a verbal agreement with RFD TV to have faculty and staff from the college of Liberal Arts and the college of Agriculture, Food and Environmental Sciences produce agriculture stories for the network. So far, the venture has cost Cal Poly at least $373,000. Those figures represent faculty, staff and equipment costs for reporting in 2014 and 2015. That reporting is seen on the 89th rated cable network in America with an average prime time viewership of 144,000, according to Variety’s analysis of the channel’s ratings. The arrangement raises questions about the use of state resources to support a private business, especially where the network has so few viewers. Market Day, RFD TV’s showcase for current ag news and the program that features the Cal Poly reports has a viewership that ranges from as little as 4,000 to as many as 50,000, Variety’s analysis found. In early 2013, Bernard invited Armstrong to an overnight stay at a working ranch owned by his father. Armstrong responded back with a request to bring his son. After Bernard said they would make room for Zack, Armstrong requested Bernard provide transportation for Zack and wanted to know if he needed to bring any of the food or drinks. Armstrong said in the end, he provided his son’s transportation and also brought wine to the social event. “We have all food and drink, all you have to do is bring your gear and some good laughs and we will be set,” Bernard responded in an email. Armstrong said that because Bernard is a close friend and it was a personal trip, he was not required to report it on his statement of economic interest. 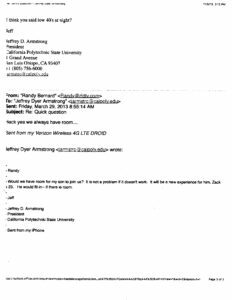 Shortly afterwards, Armstrong entered into the agreement where Cal Poly faculty and staff would produce a five-minute segment once a week for RFD TV that would be aired Monday mornings. RFD TV would not cover any of Cal Poly’s costs. 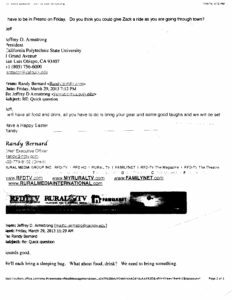 At that time, RFD TV executives were clear that they did not want student quality work. As a result, two professors and a technician were pulled from their other duties to spend time producing segments for RFD TV. Two other ag college faculty members were assigned to do research for the segments. In May 2014, Cal Poly began making segments for RFD TV. The faculty were given assigned time, in which their teaching assignment was reduced by one course for each of the quarters that they worked on the RFD TV segments while still being paid for teaching full time. In addition, the faculty and staff are being paid for producing additional content for RFD TV. In 2014, the cost for labor, travel, and equipment to Cal Poly was more than $170,000. according to documents obtained through the California Public Records Act. In 2015, it was $200,000. Cal Poly has said that it will provide figures for the cost of the service to the private cable channel in 2016. Armstrong says it is a great deal because it provides learn by doing for students and marketing to 60 million homes. “The value of marketing to 60 million households is very important,” Armstrong said. Dean of the College of Liberal Arts Douglas L. Epperson also touted the importance of marketing to 60 million homes. 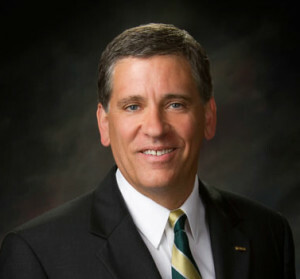 “Given the extremely high quality of our products, their airing on a national cable network in 60 million-plus homes with a clear and explicit attribution to Cal Poly, the resulting positive publicity for Cal Poly (including CLA and CAFES) and California agriculture, and the learning opportunities for students – yes, I believe that this was a wise investment of CLA resources,” Epperson wrote in an email. But while RFD TV is available to 60 million homes through its carriage on cable television systems, the channel does not have 60 million viewers or even 6 million viewers. The Cal Poly segments on RFD TV’s Market Day viewership ranges from 4,000 to 50,000 people nationwide, according to figure provided by Variety. (In comparison, CalCoastNews is available to more than 4 billion homes, but the site has about 140,000 unique viewers per month and a top daily viewership of approximately 87,000.). Armstrong also said the agreement provides learn by doing for faculty. Associate Professor Richard Gearhart reports the stories for the cable channel. “I like faculty having participation in learn by doing and extra pay,” Armstrong said. Gearhart already has been a fixture of local broadcasting at KSBY, Channel 6, for more than a quarter of a century. Gearhart also taught agriculture communication at Cal Poly for more than five years. Following the CalCoastNews public records request for documentation about the Cal Poly arrangement with RFD TV, the university began to bring students into production in larger numbers. Armstrong said he plans to have students sell adds which would bring revenue to the campus. But figures are not available to show how much revenue the ads would bring on the low-rated cable channel. Epperson said there has been some student involvement since the program started, though it increased in 2015. It was not made clear how the student involvement would figure into RFD TV’s position because they did not want student-quality work from Cal Poly. Don’t miss links to breaking news, like CCN on Facebook. In a two-page letter to Katehi, Napolitano wrote that she would be placed on leave for at least 90 days as a probe is conducted into the employment of her daughter-in-law and salary increases for her that have boosted her pay by $50,000 over two and a half years. Napolitano also wrote that she had concerns about whether Katehi made “material misstatements” about her role in UC Davis spending $175,000 on an attempt to scrub the Internet of negative stories about the school – and Katehi herself – resulting from the 2011 pepper spraying of students. There’s an aspect of this that’s unreported. Cal Poly has a long-standing program for educating ag journalists through the Brock Center. Since Brock isn’t mentioned, it’s unclear whether they are involved, but if they are, this acivity isn’t as out of line as the storyline in CCN might indicate. IF this is a legitimate part of the ag journalism program, the dollar numbers cited are actually pretty small if students are actually learning the trade. So, how about a follow up? So you bring up “the Brock Center” to cast doubt and some if’s around? Also “educating ag journalists” you mean students? because they are not journalists yet. 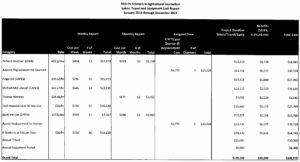 Now hijinks, almost $400,000 for a handful of students to get experience in an ag journalism program? I wish they would spend a fraction of that on some program that benefits students in programs where they might actually get a job and pay some taxes for the next kids starting college. Nothing would justify those expenses for such a small return, benefiting so few students. We all know this kind of thing goes on all the time in the public sector, this is just one time when we hear about it. As another poster pointed out, this is mild compared to some of the “political corruptness” that is a part of everyday Cal Poly. That being said, Cal Poly is a target rich environment for investigative reporting such as CCN, so it is a mystery to me why CCN seems to look the other way. Is Cal Poly’s reach that extensive that outsiders are afraid to say anything? We all know insiders get whacked it they’re not part of the Cal Poly team. It’s fair to say that since the editor in chief is a Poly professor there might be concern about blowback. I think it’s also fair to say that it’s hard to dig out the details of many of the Poly shenanigans… people are afraid to talk and make waves. A Good-Old-Boy deal is stuck that uses Tax payer money and people are shocked and surprised? The King of SLO gets to dole out some payola to his friends, how dare you even question it. No…in fact….he needs a raise and bonus! Wow! Now Karen’s taking on the City of Cal Poly.